Hundreds of local folks wisely took a break from the chaos of Black Friday shopping this weekend to wander peacefully among like-minded souls and find a handmade gift or two along the way at the 29th annual Arts Alive Holiday Arts and Crafts Festival at Tillett Gardens. No shopping carts, long lines or sharp elbows at the lush venue ringed with palm trees, a sheltering genip tree, resident iguanas and a bubbling fountain. Guests were serenaded throughout the day with sounds from local musicians. Saturday saw the reappearance of 2 Blue Shoes with Smoky Pratt and John Brittain, announced by master of ceremonies Doug Lewis. Ras Abajah started things off at noon Saturday with reggae sounds. Lewis said Sunday will feature veteran performers Polly and Fred Watts, who now are calling themselves Pure and Simple — better known as Harmony Dem. Youngsters bounded around the displays, stopping only to cast a pleading glance at a parent when something looked irresistible. 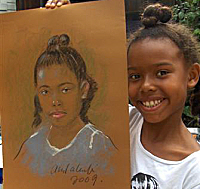 Amelia Notting, a seven-year-old Montessori student, stopped long enough to sit for a pastel likeness by artist Ahmed Alarefi. Her mom, Osa Notting, looked mighty pleased, as did the artist himself. "I usually work in oils," he said, "but I enjoy this, too." The venue abounded with all manner of original artwork, jewelry, local crafts, fused glass, handmade quilts, soaps, pottery and the Tillett’s famous silkscreen prints and maps. Montessori School and International Academy student Aileen Phelan along with teacher Gloria Zakers were busily hawking original Christmas cards to raise money for a trip to Costa Rica this spring. "We’re going on an ecological trip to study the leatherback turtles," Zakers said. Traditional candle-maker Jason Budsan had a new/old helper. Another erstwhile candle-maker, George White, just returned to the island he called home for more than 30 years. "I was living in Maine," he said. "Awful, too cold. I’m helping Jason for a while. I’m just so happy to be back home." Budsan, for his part, showed off his newest Caribbean Herbals creation. "It’s a ‘Virgin Islands S(cent)ed Candle,’" he said. The four-sided pillar candle has a brand new V.I.quarter in each side. Budsan, never still, pulled out a roll of quarters and poured them into his hands, saying "I’m the bank’s best customer." Jeweler Elizabeth LaPlace showed handsome silver dangle earrings, created with seasan coral she finds on the beach, which she designed into slender black strands. Along with the elegant jewelry, LaPlace displayed tiny French house paperweights made out of rocks from Hull Bay. They are typical, LaPlace said. "Notice, each house has a goat." Shopper Louisa Beers, stopping for a bite to eat at Jack’s Restaurant, held out a mobile of plastic cherubs. "I have no idea what it is,"she said. "Certainly, nothing I can’t live without." Dennis Parker, two years retired from a long teaching career at the University of the Virgin Islands, was having fun joking with folks about the wooden creations he now busies himself with. "People say they’re whimsical,:" he said, indicating a goat wearing a Santa hat. "I like to make them local, like this island jigsaw puzzle – it makes a nice educational present." Certainly more so than the goat. Meanwhile, an obviously hand-lettered plea could be seen above a display of $2 glass magnets: "Please help buy Caitlin a dress she really, really wants." The candid seven-year-old artist was not present Saturday afternoon to speak for herself, but mother Cindy Born said, "She wants this dress from Kool Kids at Yacht Haven Grande. It’s $89. She’s already made $30. She made our first sale today." Born, who displayed beach glass earrings in varying shades of blues and greens, said she and Caitlin kayak and scour the beaches to collect the glass. There was no shortage of originality. Marnie Stanfield and Karyn Gould showed sand molds they had fashioned into pendants and ornaments, some from their dog’s paw print. Joe and Susie Franz, two years on island from Michigan, displayed handmade wooden soldier fish fan pulls, with a tiny fan attached. Lynn Berry, festival executive director, was very pleased by the turnout. Taking a moment to relax on a nearby bench, she said, "It’s really good this year. I think people have had enough of pinching pennies and are bringing out a few dollars. It the economic stimulus for us. It’s already better than last year." Doreen Walsh, who manned the raffle ticket table, agreed. "We’ve been busy both days so far, lots of money for the festival and really nice prizes," she said. The project is supported in part by a grant from the V.I. Council on the Arts and the National Endowment for the Arts, a federal agency. The festival, open from 10 a.m. to 5 p.m, closes Sunday.